This review evaluates the current Landfill Gas (LFG) utilisation technology across Africa and gives general overview on the global context. With the increase in global Municipal Solid Waste (MSW), the world has embraced landfilling to be its major way of MSW management. About 85% of the world’s MSW is deposited in landfills. This has brought increased concerns of gases emitted from landfill sites. These gases have contributed enormously to the global anthropogenic Greenhouse Gas (GHG) emission which are detrimental to the world’s environmental media. Although significant progress has been made on the utilization of landfill gases but this is limited to some developed countries, while in Africa, there has been limited strategies and control of LFG emissions. This review spotted several reasons that could have influenced the low development of LFG utilisation in Africa as ranging from lack of skilled expertise, inadequate knowledge of the technology involved, lack of political will, inadequate funding for LFG utilization projects and monopoly of the power sector among others. It is recommended that urgent attention should be given to LFG utilisation as it can aid in acquiring carbon credits, reduction in obnoxious smell and odours, and provide the much-needed energy which is crippling the economy in Africa as well as reducing the consequences associated with the release of greenhouse gases to the environment. Keywords: Africa, Energy, Greenhouse gases, Landfill, Solid waste, Globalization, Anthropogenic. © 2018 Obinna et al. With the recent move towards globalization by the modern world, Municipal Solid Waste (MSW) generation is rapidly increasing. The world’s urban residences generate approximately 1.3 billion tonnes/year of MSW, which is about 1.2 Kg/person/day and it is expected to increase to about 2.2 billion tonnes/year by 2025 [1Hannan M A, Mamun Al, Basri H, Begum RA. A review on technologies and their usage in solid waste monitoring and management systems: Issues and challenges. Waste Manage.2015; 43: 509-23. Available online: https://doi.org/10.1016/j.wasman.2015.05.033]. Africa generates approximately 62 million tonnes/year of MSW, but there are differences among cities in Africa. Larger cities tend to generate more MSW than smaller ones. MSW generated in Africa ranges from 0.09-3.00 Kg/person/day with an average of 0.65 Kg/person/day [2Hoornweg D, Bhada-Tata P. What a waste A global review of Solid waste management.Urban development series knowledge papeis.2012; 15: 1-98. Available online: http://hdl.handle.net/10986/17388]. Waste management is focused on managing all processes and resources for appropriate handling of waste materials, from maintenance to waste transport trucks and dumping facilities in compliance with health codes and environmental regulations [3Rushton L. Health Harzards and Waste Management. Brishtish Medical Bulleton, 2003; 183-90. [http://dx.doi.org/10.1093/bmb/ldg034] ]. 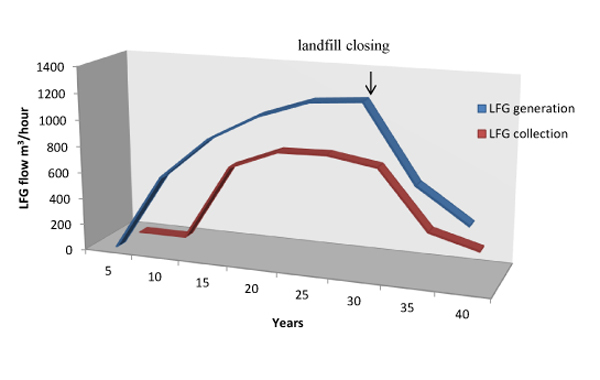 Landfill has been a common acceptor for waste in the past decades. However, countries in Africa including South Africa, Algeria, Cameroon, Madagascar, Mauritius, Morocco, Niger and Tunisia deposit approximately 95%, 97%, 95%, 96%, 91%, 96%, 64%, and 95%, respectively, of their MSW in landfills and dumpsites [4Scarlat N, Motola V, Dallemand JF, Monforti-Ferrario F, Mofor L. Evaluation of energy potential of municipal solid waste from African urban areas. Renewable Sustainable Energy Rev.2015; 50: 1269-86. [http://dx.doi.org/10.1016/j.rser.2015.05.067] ]. According to the waste management hierarchy chart Fig. (1 ), waste disposal is considered to be the last favoured option of solid waste management, but most countries still prefer to use landfill because it is cheap in terms of capital and easy to use compared to other MSW management techniques [5Aderemi AO, Falade TC. Environmental and health concerns associated with the open dumping of municipal solid waste: A Lagos, Nigeria experience. Am J Environ Eng 2012; 2: 160-5.http://article.sapub.org/10.5923.j.ajee.20120206.03.html[http://dx.doi.org/10.5923/j.ajee.20120206.03] , 6Schiopu AM, Gavrilescu M. Options for the treatment and management of municipal landfill leachate: common and specific issues. Clean Soil, Air, Water, 2010, 38, 1101-1110. [http://dx.doi.org/10.1002/clen.200900184] ]. Landfill Gas (LFG) is a complex mixture of different gases formed by the action of microorganisms within a landfill [7Ehrig HJ, Schneider HJ, Gossow V. Waste 7 deposition. Ullmann’s Encyclopedia of industrial chemistry. 2011. [http://dx.doi.org/10.1002/14356007.o28_o07] ]. Mismanagement of landfill can lead to uncontrolled emissions of LFGs such as CH4 and CO2 which contribute enormously to climate change; pungent odours, litters and dust in the vicinity; seepage of leachate formed in the landfill into ground water and surface water [8Health Protection Agency. Impact on Health of Emissions from Landfill site, Advice from the Health Protection Agency. Available online: https://www.gov.uk/government/uploads/system/uploads/attachment_data/file/334356/RCE-18_for_website_with_security.pdf (accessed on 7th November, 2016).]. In 2011, the United States recorded 1908 landfills which generate approximately 1.03 × 108 metric tonnes of carbon equivalent of CH4, which accounts for 17.7% of the total CH4 emitted from the United States’ into the atmosphere [9Mahajan D, Tonjes DJ, Mamalis S, Boudreaux R, Hasty JK, Xin D. Effective landfill gas management strategies for methane control and reuse technology. Journal of renewable and esustainable energy. 2015; 4: 1-7. [http://dx.doi.org/10.1063/1.4929383] ]. In 2013, China recorded 580 landfills and the CH4 emitted from these landfills accounted for 13% of the total CH4 emitted from China [9Mahajan D, Tonjes DJ, Mamalis S, Boudreaux R, Hasty JK, Xin D. Effective landfill gas management strategies for methane control and reuse technology. Journal of renewable and esustainable energy. 2015; 4: 1-7. [http://dx.doi.org/10.1063/1.4929383] ]. In Europe, landfill recorded the second largest source of CH4 emitted from anthropogenic activity, which was 22% of estimated CH4 from waste disposal sites [10Scheutz C, kjeldsen P, Bogner JP, et al. Microbial methane oxidation processes and technologies for mitigation of landfill gas emission. Waste Mangement & Research. 2009; 27: 409-55. [http://dx.doi.org/10.1177/0734242X09339325] ]. Africa is the most vulnerable part of the world in relation to the consequences associated with uncontrolled emission of LFG [11Challinor A, Wheeler T, Garforth C, Craufurd P, Kassam A. Assessing the vulnerability of food crop systems in Africa to climate change. Clim Change 2007; 83: 381-99.https://link.springer.com/article/10.1007/s10584-007-9249-0[http://dx.doi.org/10.1007/s10584-007-9249-0] ]. The total potential methane generated from Africa in 2012 was 10,496×106 m3 (assuming all the waste generated are landfilled), therefore management of LFG generated is of great importance [4Scarlat N, Motola V, Dallemand JF, Monforti-Ferrario F, Mofor L. Evaluation of energy potential of municipal solid waste from African urban areas. Renewable Sustainable Energy Rev.2015; 50: 1269-86. 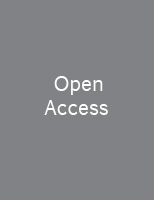 [http://dx.doi.org/10.1016/j.rser.2015.05.067] ]. LFG utilisation involves the process of collecting and processing LFG derived from the decomposition of solid waste from a landfill, in order to use it to produce electricity, fuel, heat and various useful chemical compounds. There are increasing numbers of LFG utilisation technologies which are functioning around the world. Africa has approximately 1% of the total LFG utilisation technology in the world and the rate of increase in the technology as the years go by is very low [12Urase T, Okumura H, Panyosaranya S, Inamura A. Emission of volatile organic compounds from solid waste disposal sites and importance of heat management. Waste management and research, 2008, 6, 534-538. Available online: https://doi.org/10.1177/0734242X07084321]. Africa has a population of approximately 1.2 billion people which is about 15% of the world’s population [13Population A. Available online: http://worldpopulationreview.com/continents/africa-population (accessed on 9th July 2017).]. However, Africa majorly depends on landfilling for its MSW management. Therefore, as the population of Africa increases in coming years, MSW generation is expected to increase, hence the increase in landfill sites. Africa has not been able to utilise this LFG generated from landfills and African leaders and scholars have not given much attention to the beneficiation of emitted LFG from African landfills. Gases generated from landfill sites could be useful alternatives for the provision of energy in most African countries. For example, In Kampala (Uganda), the estimated utilisation of LFG to electricity was 31000 megawatt (MWh) in 2009 and 26600 (MWh) in 2011 [14Mwesigye P. Africa review report on waste management. In Proceedings of the 6th session of the UNECA Committee on Food Security and Sustainable Development (CFSSD)/Regional Implementation Meeting (RIM) for CSD-18, 2012. Addis Ababa, Ethiopia. Available online: http://repository. uneca. org/handle/10855/3134 (accessed 6th December, 2017).]. South Africa and Nigeria together with other African countries are considering LFG utilisation as a major source of electricity [15Couth R, Trois C, Parkin J, Strachan LJ, Gilder A, Wright M. Delivery and viability of landfill gas CDM projects in Africa-A South African experience 2011; 15: 392-403. [http://dx.doi.org/10.1016/j.wasman.2010.04.013] ]. This paper therefore, seeks to give an overview of the LFG generation and utilisation technology in Africa and assess the global view of LFG utilisation. It focuses on the potential generation of energy from LFG generated in Africa. It also looks into the potential social-economic aspects of LFG utilisation in Africa. In addition, the study poses possible recommendations to LFG utilisation in Africa. LFG is generated largely by bacterial decomposition of organic waste present in a solid waste landfill. LFG production in landfills involves three stages viz-a-viz bacterial decomposition, chemical reactions and volatilisation [7Ehrig HJ, Schneider HJ, Gossow V. Waste 7 deposition. Ullmann’s Encyclopedia of industrial chemistry. 2011. [http://dx.doi.org/10.1002/14356007.o28_o07] ]. this is the major process in the production of LFG and entails the decomposition of organic waste by bacteria into various gaseous products and by-products [7Ehrig HJ, Schneider HJ, Gossow V. Waste 7 deposition. Ullmann’s Encyclopedia of industrial chemistry. 2011. [http://dx.doi.org/10.1002/14356007.o28_o07] ]. This first stage of LFG generation occurs in five phases shown in Fig. (2 ). Composition of Landfill Gas with Time [16Agency for Toxic Substances and Disease Registry (ATSDR). Landfill gas premier: an overview of environmental health professionals. Available online: http://www.atsdr.cdc.gov/hac/landfill/html/intro.html (accessed on 7 October 2016).]. In Phase I aerobic bacteria decompose the long molecular chains of carbohydrates, protein and lipids found in the organic waste in the landfills in the presence of available oxygen, this phase can go on for days - months until the total oxygen is used up. The oxygen present result from the loose compaction of solid waste when buried. The end –products of this phase are CO2, heat and water. Nitrogen content is high but will continue to undergo decay as the phase continues [16Agency for Toxic Substances and Disease Registry (ATSDR). Landfill gas premier: an overview of environmental health professionals. Available online: http://www.atsdr.cdc.gov/hac/landfill/html/intro.html (accessed on 7 October 2016).]. The decomposition process then continues to phase II which begins after the oxygen in the landfill is exhausted. In this anaerobic process, bacteria change the compounds from phase I process into acetic, lactic, formic acids and alcohols such as methanol and ethanol. This is a very acidic process; the acid present in the waste combines with moisture and makes certain nutrients to dissolve producing chemical compounds like nitrogen and phosphorus in the landfill. Carbon dioxide and hydrogen are then generated as end products, if the landfill is disturbed and air enters then phase II goes back to the phase I process [17Landfill Methane Outreach Programe (LMOP). LFG Energy project development handbook Available online: https://www3.epa.gov/lmop/ documents/pdfs/pdf_full.pdf (accessed on 10th October, 2016)]. Phase III is mainly where the methanogenesis process starts. The anaerobic bacteria use the acid generated in phase II to form acetate. Furthermore, the methane producing bacteria begins to emerge. Acid manufacturing bacteria produce compounds for the methanogenic producing bacteria for use. At this phase hydrogen peaks, Chemical Oxygen Demand (COD), Total Volatile Acid (TVA) concentration peaks as well in the concentration of the leachate [16Agency for Toxic Substances and Disease Registry (ATSDR). Landfill gas premier: an overview of environmental health professionals. Available online: http://www.atsdr.cdc.gov/hac/landfill/html/intro.html (accessed on 7 October 2016).]. Phase IV is when the time for equilibrium has reached, making the production rate and composition constant. Approximately 45% - 60% methane, 40% - 60% CO2, and 2% - 9% of other gases are produced. This can go on for a period of 20 years after closure of landfill [18Brindley T. Landfill Gas - Industry Code of Practice: The Management of Landfill Gas. Environment Services Association, United Kingdom. 2012. Available online: http://www.esauk.org/reports_press_releases/esa_reports/LandfillgasICoP2012web.pdf]. Finally, the decomposition process reaches phase V in which most LFG emissions occur, the pressure in the landfill waste compartment is higher than pressure of the ambient atmosphere. 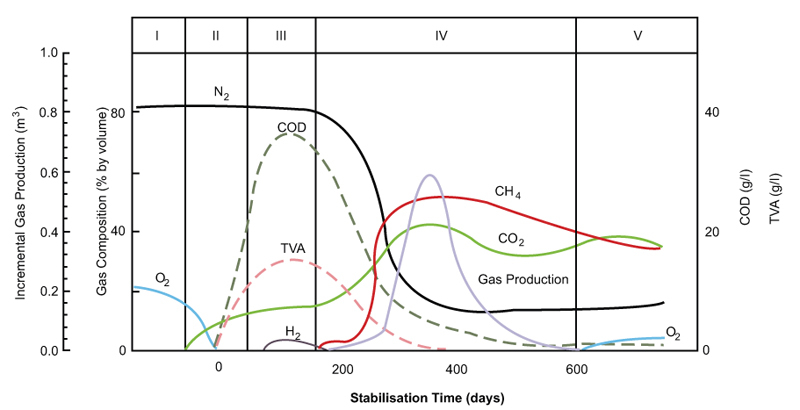 In this long-term phase, the volume of CO2 decreases with respect to the methane emissions, the ratio can range up to 4:1 CH4 to CO2 emissions [19Bialowiec A. Hazardous emissions from municipal solid waste landfills. Some aspects of environmental impact of waste dumps. Contemporary problems of management and environmental protection, 2011; 9: 7-28. Available online: http://www.uwm.edu.pl/environ /vol09/vol09_chapter01.pdf (accessed on 30th of September 2017).]. different chemical substances present in the landfill waste can react chemically together in the presence and/or absence of moisture, oxygen (O2) and carbon dioxide (CO2) to produce different forms of LFG [17Landfill Methane Outreach Programe (LMOP). LFG Energy project development handbook Available online: https://www3.epa.gov/lmop/ documents/pdfs/pdf_full.pdf (accessed on 10th October, 2016)]. For example, anhydrous oxidation of aluminium from raw trash or metals reacts with oxygen with or without the presence of water. Al + OH-1 + 3H2O → [Al (OH-1)4]-1 + (3/2) H2. AlN + 3H2O → Al (OH)3 + NH3, the odour of ammonia gas indicates the landfill is alkaline in nature. 6H2O + Al2S3 → 2Al (OH)3 + 3H2S, these end products are characterized by pungent odour [21Haynes WM, Ed. CRC handbook of chemistry and physics; Lide, R.D., Bruno, T.J.;CRC press: New York, USA. 2014, 2704 pages, ISBN	9781482208689]. chemical substances vaporise or sublime into the atmosphere from a solid or liquid state. These chemical substances are usually characterised with low boiling point. A Study identified that volatile compounds like hydrocarbons, aromatic substances, oxygenated, chlorinated and sulphur compounds as present in landfill sites [22Statheropoulos M, Agapiou A, Pallis G. A study of volatile organic compounds evolved in urban waste disposal bins. Atmospheric Environment.2005; 39: 4639-45. [http://dx.doi.org/10.1016/j.atmosenv.2005.04.013] ]. A study identified similar volatile compounds such as benzene and trim ethyl benzene as present in a landfill [12Urase T, Okumura H, Panyosaranya S, Inamura A. Emission of volatile organic compounds from solid waste disposal sites and importance of heat management. Waste management and research, 2008, 6, 534-538. Available online: https://doi.org/10.1177/0734242X07084321]. The study also concluded that polystyrene plastic waste was known as the major source of the volatile chemical compound in the landfill [12Urase T, Okumura H, Panyosaranya S, Inamura A. Emission of volatile organic compounds from solid waste disposal sites and importance of heat management. Waste management and research, 2008, 6, 534-538. Available online: https://doi.org/10.1177/0734242X07084321]. Fig. (3 ) shows the LFG generation and possible collection capacity in m3/hour. 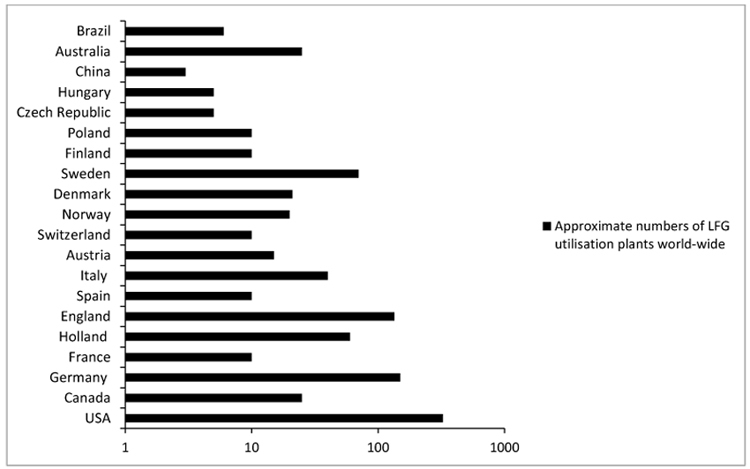 A diagram for LFG generation and collection capacity in m3/hour against time [4Scarlat N, Motola V, Dallemand JF, Monforti-Ferrario F, Mofor L. Evaluation of energy potential of municipal solid waste from African urban areas. Renewable Sustainable Energy Rev.2015; 50: 1269-86. [http://dx.doi.org/10.1016/j.rser.2015.05.067] ]. Typical Landfill Gas Components [16Agency for Toxic Substances and Disease Registry (ATSDR). Landfill gas premier: an overview of environmental health professionals. Available online: http://www.atsdr.cdc.gov/hac/landfill/html/intro.html (accessed on 7 October 2016).]. Assurance of continuous flow of municipal solid waste. The best LFG utilisation system for the proposed landfill. The availability of potential end users for the use of the technology. The quality and duration of the potential LFG generation. The capital cost, expenditure and operating costs for the utilisation technology. Availability of skilled operators for the operations of the technology. The use of LFG can be in various forms which include, direct use; in the form of electricity; as a boiler system; use as vehicle fuels; use as natural gas network and use as leachate evaporation. The summary of the LFG utilisation, advantages and disadvantages are summarised in Table 2. Summary of LFG utilisation [28Global Methane Initiative. Landfill gas modelling. International best practices guide for LFGE projects. Available online: https://www.globalmethane.org/ documents/toolsres_lfg_IBPGch6.pdf (accessed on 2nd September, 2016)]. Since the mid-1970, LFG has been used as a renewable source of energy in the form of electricity and fuel to communities, individuals and industries. The world population increased from about 3.1 billion in 1960 to approximately 7 billion in 2015 and by 2025 the population is expected to rise to approximately 8 billion people. As population, urbanization and world economy increases, the generation of MSW is expected to increase [24 FAO Statistics Available at: Food and Agriculture Organisation of the United Nations. Available online: http://faostat3faoorg/ faostat-gateway /go/to/home/E accessed 6th November 2016]. Therefore, as MSW increases the need for more landfill sites will also increase globally. LFG globally contributes approximately 8% of the world’s total greenhouse gas (GHG) emitted into the atmosphere [4Scarlat N, Motola V, Dallemand JF, Monforti-Ferrario F, Mofor L. Evaluation of energy potential of municipal solid waste from African urban areas. Renewable Sustainable Energy Rev.2015; 50: 1269-86. [http://dx.doi.org/10.1016/j.rser.2015.05.067] ]. Globally, there are more than 1000 LFG plants where most of these plants are situated in Europe and US; with South Africa having 4 LFG plants and the technology has been growing in other parts of Africa [12Urase T, Okumura H, Panyosaranya S, Inamura A. Emission of volatile organic compounds from solid waste disposal sites and importance of heat management. Waste management and research, 2008, 6, 534-538. Available online: https://doi.org/10.1177/0734242X07084321]. The European Union (EU) approximately deposits an average of 45% of its MSW into landfills with greater percentage of MSW deposited from her new member states. The EU has been experiencing an increase in waste generation and adverse effects from landfill operations. The EU formulated a policy on landfill called the Directive 1999/31/EC which is geared towards possible reduction of the negative effects of landfilling in the environment [25Directive E W L. 1999. Council Directive 1999/31/EC. L, 182(1), 26-4.]. The EU has the highest amount of LFG utilisation plants in the world, currently operational [12Urase T, Okumura H, Panyosaranya S, Inamura A. Emission of volatile organic compounds from solid waste disposal sites and importance of heat management. Waste management and research, 2008, 6, 534-538. Available online: https://doi.org/10.1177/0734242X07084321]. Croatia had 136 operational landfills and already 4 LFG plants were commissioned by the Croatian government in 2015 and a potential of 90 LFG plants existed [26Medarac H, Scarlat N, Monforti-Ferrario F, Bodis K, Krstic A, Dallemand JF. Analysis of Croatian potentials of municipal solid waste for bioenergy. 23rd European biomass conference and exhibition (EUBC&E) 2015 in Vienna, Austria.]. Germany is the highest producer of energy from LFG; produced electricity from biogas that powered about 3.5 million homes in 2009. Since 2005, Sweden has been using LFG to power a biogas powered train which moves about 75 miles [27The Sustainability Corporation. 5 things you should know about generating electricity from landfill gas.2014. Available online: https://thesustainabilitycooperative.net/ 2014/07/09/5-things-you-should-know-about-generating-electricity-from-landfill-gas]. China has the world’s largest population of approximately 1.3 billion in 2017 and the urban areas generate about 190 million tonnes of MSW with a projected increase to 480 million tonnes/year in 2030, if migration to urban cities averages more than 300 people. China with its rapid growth in economy and urbanization has increased drastically in its MSW generation, although the management of its MSW is on the development stage [35Hoornweg D, Lam P, Chaudhry M. 2005. Waste management in China: Issues and recommendations. Urban Development Working Papers, (9).]. Landfilling is the most used technique for the disposal of MSW in China with 89% of total MSW deposited in landfills. China had its first LFG energy plant in June 1999 (Guangzhou Guang Jia), and as years went by, other LFG plants were constructed. Approximately 18 LFG utilisation plants were finalised at the end of 2007, with 15 generating electricity [36Raninger B, Zhou H. Biogas from landfills or anaerobic digestion plants in China-comparison of biomass wastes in china, 2012; 579-90. Available online: http://www.vivis.de/phocadownload/Download/2012_wm/2012_WM_579_590_Raninger.pdf]. The Shanghai Laogang (one of Asia’s largest LFG plants) produced about 24,400 MWh of electricity in 2012. Also, the Nanjing Shui-Ge LFG project which was mainly sponsored by United Nations Development Programme (UNDP) has generated more than 4050 KW since 2002 [37Mourant A. Spotlight on landfill gas energy: eye on china and india Available online: http://www.renewableenergyfocus.com/ view/37403/spotlight-on-landfill-gas -energy-eye-on-china-and-india/ (accessed 4th December 2017).]. China is challenged with availability of land for landfill and proximity to residential areas, in 2014 according to Zhou- the general manager of Veolia He said, “The Chinese have not been focusing on landfill- if they can avoid it, they will” [37Mourant A. Spotlight on landfill gas energy: eye on china and india Available online: http://www.renewableenergyfocus.com/ view/37403/spotlight-on-landfill-gas -energy-eye-on-china-and-india/ (accessed 4th December 2017).]. Furthermore, a research conducted at the biotechnological laboratory at the Institute of Clean Energy and Environment (ICEE) Aerospace University showed the comparison between Chinese MSW degradation potential and Western MSW. 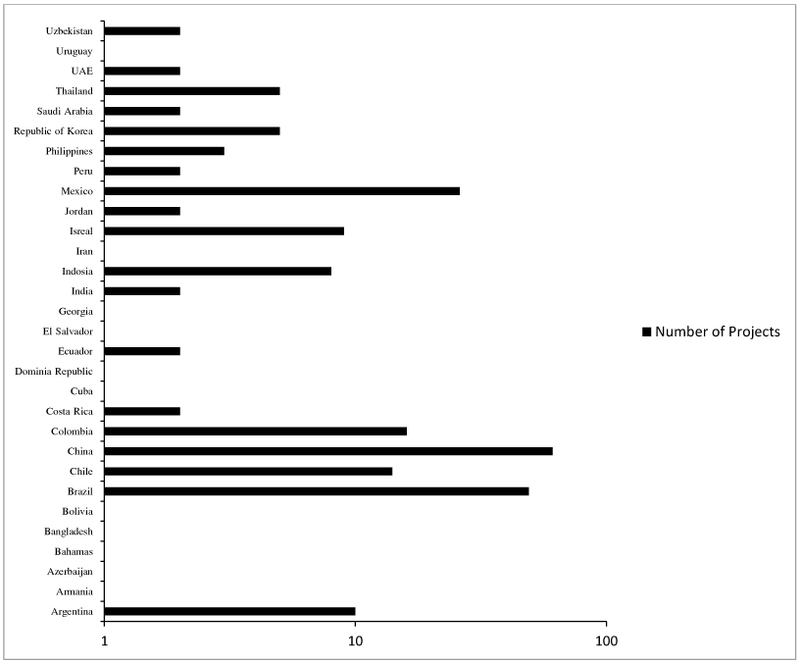 The study showed that the Chinese MSW has a higher degradation potential than the Western MSW, because of the high level of organic waste present in the MSW [36Raninger B, Zhou H. Biogas from landfills or anaerobic digestion plants in China-comparison of biomass wastes in china, 2012; 579-90. Available online: http://www.vivis.de/phocadownload/Download/2012_wm/2012_WM_579_590_Raninger.pdf]. Some of the success stories accounting for the use of LFG as a source of energy in the US includes; Coca-Cola’s Atlanta syrup branch - 48 million kw/h of electricity generated from a nearby landfill. This LFG project provides almost all the needed company energy in the form of steam, electricity and chilled water. Furthermore, about $1.3 million is being saved annually by the U.S. Navy in utility cost at the Marine Corps logistics base in Albany Georgia, because of the cogeneration plant that started operations in 2011. Gudersen health systems on Alaska campus use LFG from La Crosse county, Wisconsin for electricity to supply the campus with heat energy, resulting to saving about $100.000 annually [27The Sustainability Corporation. 5 things you should know about generating electricity from landfill gas.2014. Available online: https://thesustainabilitycooperative.net/ 2014/07/09/5-things-you-should-know-about-generating-electricity-from-landfill-gas]. Fig. (5 ) shows the approximate number of world-wide LFG utilisation technology as of 2001 [29Willumsen HC. Energy recovery from landfill gas in Denmark and worldwide. LG Consultant.2001. Available online: http://www.lei.lt/_img/_up/ File/atvir/Opet/pdf/Willumsen.pdf]. However, as of November 2017, the LFG utilisation technology in the USA doubled to 637 operational LFG utilisation plants and some additional potential 400 landfills are good candidates for future LFG utilisation technology [27The Sustainability Corporation. 5 things you should know about generating electricity from landfill gas.2014. Available online: https://thesustainabilitycooperative.net/ 2014/07/09/5-things-you-should-know-about-generating-electricity-from-landfill-gas] Fig. (4 ). In England, 2015 the LFG utilisation plants rose up to 361 LFG utilisation plants, this is about triple the LFG utilisation plants since 2001 and generated approximately 4106.4 GWh of electricity from LFG technology in 2015 [45Karekezi S. 2002. Poverty and energy in Africa—a brief review. Energy Policy. 2002, 30, 915-919. [http://dx.doi.org/doi.org/10.1016/] ]. However, with the continuous rise in LFG utilisation technology in mostly developed nations, the introduction of the Clean Development Mechanism (CDM) and JI projects gave rise to LFG utilisation technology in developing nations. LFG utilisation projects as of July, 2016 [38USEPA (United States Environmental Protection Agency), LMOP (Landfill Methane Outreach Programme), Landfill gas energy project data and landfill technical data. Available online: https://www.epa.gov/lmop/landfill-gas-energy-project-data-and-landfill-technical-data (accessed on 15th November 2017)]. As of 2001, LFG utilisation technology available world-wide [29Willumsen HC. Energy recovery from landfill gas in Denmark and worldwide. LG Consultant.2001. Available online: http://www.lei.lt/_img/_up/ File/atvir/Opet/pdf/Willumsen.pdf]. Fig. (6 ) shows the number of registered LFG to energy CDM projects all around the world. Number of CDM LFG utilisation projects around the world [40UNFCCC database: http://cdm.unfccc.int/Projects/projsearch.html (accessed 22nd November, 2017)]. Africa is comprised of both developing and underdeveloped nations, where most regulations, technologies and management practices are still emerging. MSW is one of the major problems faced by African countries, of which about 20-50% of their budget is allocated to solid waste management [41Achankeng E. Globalization, urbanization and municipal solid waste management in Africa. Proceedings of the African Studies Association of Australasia and the Pacific 26th Annual Conference 2003.]. The open dumping system- which is the primitive stage of landfill is still the major way in which MSW has been disposed in Africa. Although, it is paramount to upgrade open dump system to sanitary landfills, many African countries do not see it as a priority or a necessity [42Johannessen LM, Boyer G. Observation of solid waste landfills in developing countries: Africa, Asia and Latin America. The World Bank. 1999]. Nigeria and South Africa manage most of their MSW in open dump sites and unsanitary landfill, respectively [43Centre of People and Environment (CPE). Landfill recovery and use in Nigeria (pre-feasibility studies of using LFGE). Final report for EPA, Methane-to-Market program. Washington D.C.2010.]. Hence, these open dumping systems and unsanitary landfills increase the pollution from landfills into the environmental media. Therefore, stringent guidelines, regulations and implementation should be put in place to reduce the LFG generated from MSW [44Friedrich E, Trois C. Quantification of greenhouse gas emissions from waste management processes for municipalities–A comparative review focusing on Africa. Waste management.2011; 31: 1585-96. [http://dx.doi.org/doi.org/10.1016/] ]. LFG utilisation techniques are still new technologies in Africa due to limited expertise, poverty, and the government’s laxity towards LFG utilisation in the continent, despite the increasing MSW generation coupled with population and industrial growth. South Africa is embracing the LFG utilisation as a necessity and has regulations and guidelines that support landfill operations. South Africa had its first utilisation plant of LFG in 1980’s - the Robinson Deep landfill gas scheme where a gold ore extraction process utilised the LFG. The now Department of cleansing and solid waste of the eThekwini municipality, formally called Durban solid waste city of Durban organised the second LFG utilisation in the early 1990’s [23Strachan LJ, Pass J, Couth B. Trading landfill gas: kick starting green gas-to energy. Proc Waste Con 2006. International waste management biennial congress and exhibition. Somerset West., 5-8 September 2006. IMWSA: Institute of waste management, SA, Johannesburg. ]. South Africa recorded a success in the first Clean Development Mechanism (CDM) waste-to-energy project in Africa, the project was tasked with the conversion of LFG to electricity from three landfills situated in the eThekwini Municipality (Bisasar, Mariannhill and La Mercy landfills). Some other similar registered CDM LFG projects in South Africa include the New England LFG energy project; Environserv Chloorkop LFG recovery project (registered 27th April, 2012); Alton LFG project (registered 24th August, 2009) and Ekurhuleni LFG project. Fig. (7 ) shows the registered CDM LFG projects in Africa. Registered CDM LFG utilisation projects in Africa as of December 2017 [40UNFCCC database: http://cdm.unfccc.int/Projects/projsearch.html (accessed 22nd November, 2017)]. The total LFG utilisation projects in Africa is about 15% of the total registered CDM projects. This, however shows a positive move about LFG utilisation in Africa, hence the usage of LFG is viable and a major means of methane reduction in the world. Furthermore, it implies that the governments of African countries have increased awareness of landfill emissions and their potential impacts on human health and the environment. Fig. 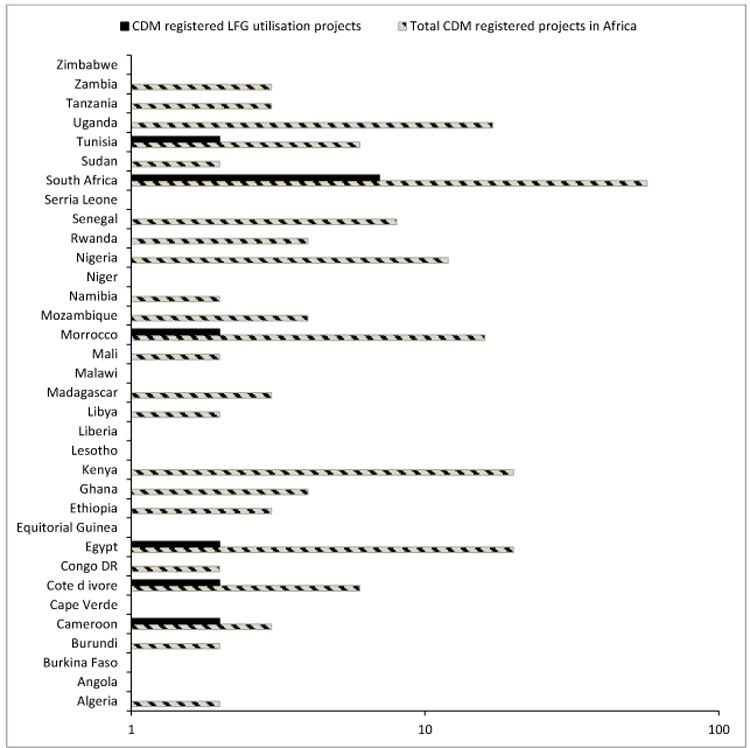 (7 ), shows that South Africa is the leading country in Africa in the CDM LFG utilisation project, having a total of 50% of the total CDM LFG projects registered in Africa because of the policies and guidelines introduced by the South African government. A study identified the potential CH4 produced from landfills in Africa as approximately 10496 × 106 Nm3 in 2012 [4Scarlat N, Motola V, Dallemand JF, Monforti-Ferrario F, Mofor L. Evaluation of energy potential of municipal solid waste from African urban areas. Renewable Sustainable Energy Rev.2015; 50: 1269-86. [http://dx.doi.org/10.1016/j.rser.2015.05.067] ]. Table 3 shows the potential quantities of CH4 produced in Africa in 2012, if all LFG generated could be collected and used for energy recovery. Also, Table 3 shows the potential amount of methane generated, assuming all the waste generated is landfilled. waste generation and collection, potential CH4 generation and possible capture, and potential electricity generation in Africa [4Scarlat N, Motola V, Dallemand JF, Monforti-Ferrario F, Mofor L. Evaluation of energy potential of municipal solid waste from African urban areas. Renewable Sustainable Energy Rev.2015; 50: 1269-86. [http://dx.doi.org/10.1016/j.rser.2015.05.067] ]. Every nation needs energy for its development. African countries generate energy majorly from oil, solar and coal. South Africa’s energy (electricity) generation is 90% powered by coal. Oil-producing African countries like Nigeria (hold about 30% of oil reserves in Africa) mainly rely on oil and gas as a source of energy [45Karekezi S. 2002. Poverty and energy in Africa—a brief review. Energy Policy. 2002, 30, 915-919. [http://dx.doi.org/doi.org/10.1016/] ]. In 1995, South Africa consumed approximately 50% of the total electricity generated in Africa, followed by Northern African countries which consumed about 30% and the rest of the continent accounts for 20%. The consumption of electricity in Africa is very low with exceptions of South Africa and some North African countries. Fig. (8 ) shows a summary of some Africa countries and their electricity consumption rates [45Karekezi S. 2002. Poverty and energy in Africa—a brief review. Energy Policy. 2002, 30, 915-919. [http://dx.doi.org/doi.org/10.1016/] ]. 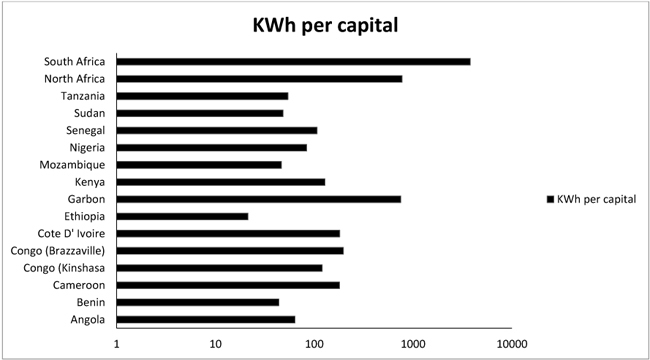 Electricity consumption in some African countries [45Karekezi S. 2002. Poverty and energy in Africa—a brief review. Energy Policy. 2002, 30, 915-919. [http://dx.doi.org/doi.org/10.1016/] ]. African governments have failed to make LFG utilisation a priority in their agenda. A study conducted on the potential energy from utilisation of LFG and incineration of MSW in urban areas of Africa (with efficiency of 20% and 30% for incineration and LFG plants efficiency, respectively). The results show that the energy generated was approximately 1125 PJ in 2012 and estimated to be 2198 PJ in 2025 (assuming all waste generated is collected) [4Scarlat N, Motola V, Dallemand JF, Monforti-Ferrario F, Mofor L. Evaluation of energy potential of municipal solid waste from African urban areas. Renewable Sustainable Energy Rev.2015; 50: 1269-86. [http://dx.doi.org/10.1016/j.rser.2015.05.067] ]. Nigeria has the highest population in Africa and generates about 17.4 million tonnes/year of MSW at a range of 0.21-0.35 kg/person/day and deposits 74% of its MSW in dumpsites and landfills [43Centre of People and Environment (CPE). Landfill recovery and use in Nigeria (pre-feasibility studies of using LFGE). Final report for EPA, Methane-to-Market program. Washington D.C.2010. ], [46Adewumi IK, Ogedengbe MO, Adepetu JA, Aina PO. Aerobic composting of municipal solid waste and poultry manure.J Applied Sc Res 2005; 1: 292-7. Available online: https://pdfs.semanticscholar.org/f627/ 5120149b7403f8108e98e1f534232cf9ac3c.pdf (accessed on the 2th may 2017).]. A study was conducted by the Centre for People and Environment (CPE) on four different landfills in Nigeria in 2010, to estimate the potential electricity that can be generated from the collected LFG. The result shows that the utilisation of the LFG in the four different landfills was economically viable and at a minimum electricity cost of $0.2 KW/h. Therefore, if most of the LFG from landfills and dumpsites are utilised, then some economic challenges the country faces on electricity generation can be minimised. Morocco generates approximately 1.0 × 107 t/year of MSW, with about 0.75 kg/inhabitant/day of waste generation. Morocco mainly uses fossil energy resources as a source of electricity and the fossil energy serves as 97% of its energy source [4Scarlat N, Motola V, Dallemand JF, Monforti-Ferrario F, Mofor L. Evaluation of energy potential of municipal solid waste from African urban areas. Renewable Sustainable Energy Rev.2015; 50: 1269-86. [http://dx.doi.org/10.1016/j.rser.2015.05.067] ], [31Sabri A. Assessing a prospective landfill gas to energy project in Agadir, Morocco.2011. Available online: http://urn.fi/ URN:NBN:fi:amk -2011120917895] The results of a study conducted on accessing a prospective LFG energy in Agadir, Morocco, showed that the introduction of LFG utilisation technology into the energy sector in Morocco will help relieve the country from its monopolistic source of energy and provide a viable business for the government [31Sabri A. Assessing a prospective landfill gas to energy project in Agadir, Morocco.2011. Available online: http://urn.fi/ URN:NBN:fi:amk -2011120917895]. Countries in the developed world are knowledgeable on the win-win situation from exhausting LFG emitted from landfill, and the projects on LFG utilisation are increasing on daily basis. However, Africa has significantly underutilised LFG technology, but what are the challenges impeding Africa from developing and using LFG technology? A research conducted on the challenges impeding South African municipalities from adopting waste-to-energy schemes; the conclusion showed the major problems were inappropriate landfill management from Municipalities for power generation and poor data on waste generation; monopolising the electricity sector, thereby making investors lose interest; poor policies on waste sector which do not give room for establishing waste to energy industries; limited knowledge on technologies by government and lack of political will; small tariffs on landfill; lack of expertise to implement project; and limited awareness of the benefits associated with the project [47Mutezo GT. Challenges impeding South African municipalities from adopting waste-to-energy schemes: an exploratory approach, Doctoral dissertation, University of Cape Town,2016.]. Lack of technical solution – LFG utilisation technologies need certain technical skills, which can only be acquired through training and experience. The LFG utilisation technology in Africa is relatively new, hence as more projects commence the skills and expertise will continue to increase [48Shakow D. Climate Change and Environmental Ethics. Routledge. Nanda, V.P Eds., Routledge: New York, USA, 2017. ISBN 178-1-4128-1459-1.]. High initial cost for the project – the equipment and expertise used for LFG utilisation project are expensive. The first CDM project in Africa which was implemented in South Africa costed about $6.5 million for the LFG utilisation project [49Couth R, Trois C. Carbon emissions reduction strategies in Africa from improved waste management: A review. Waste Management,2010.https://www.iwmsa.co.za/downloads/Landfill.pdf[http://dx.doi.org/10.1016/j.wasman.2010.04.013] ]. This is relatively expensive for private or government body to embark on. Lengthy CDM process – due to the fact that LFG utilisation projects are expensive for African government, the process to approve and register a LFG utilisation project is challenging and very long [48Shakow D. Climate Change and Environmental Ethics. Routledge. Nanda, V.P Eds., Routledge: New York, USA, 2017. ISBN 178-1-4128-1459-1.]. A proposed project with the CDM takes over 24 months for a LFG utilisation project to be registered [50Cornish D. An overview of ENER-G Systems experienced with landfill gas utilisation projects in South Africa. Proceedings of the landfill 2011 seminar, “waste management facilities”. 2011]. Harmful toxins – Compounds like mercury, cadmium, arsenic, benzene, dioxin and furan derivatives are in most cases found in landfill sites. These toxins are occasionally found in LFGs in trace quantities. The emissions and burning of these toxins can lead to harmful effects on humans including cancer, endocrine disruption and heavy metal poisoning. Africa still lacks in technology to reduce these toxins before collection of the LFG [51Vrijheid M. Health effects of residence near hazardous waste landfill sites: A review of epidemiologic literature. Environmental health prospective.2000; 108: 101-12. Available online: https://www.ncbi.nlm.nih.gov/pmc/articles/PMC1637771/]. Most African countries suffer from inadequate electricity generation. Africa is immensely behind with the capacity of electricity generated from LFG. A lot of opportunities are achieved from LFG utilisation technology today. Although, some forms of renewable energy such as wind and solar are inadequate to produce energy consistently, LFG utilisation projects help combat climate change, improve waste management, reduce air borne diseases from landfill and generate energy. Some African countries have adopted great potential from LFG utilisation projects, like South Africa. Private companies have also initiated LFG utilisation projects, for example in September 2014, the summer and jack landfill site in Germiston Gauteng which generates approximately 1MW of electricity. A study showed that the adoption of LFG energy project in Morocco will lead to increase in renewable energy (and reduce non-clean energy in the country); encourage technology transfer from developed countries for enhancing LFG utilisation plants; reduce the countries CO2 emissions and reduce environmental pollution; provide revenue for the Morocco government and energy for the people [10Scheutz C, kjeldsen P, Bogner JP, et al. Microbial methane oxidation processes and technologies for mitigation of landfill gas emission. Waste Mangement & Research. 2009; 27: 409-55. [http://dx.doi.org/10.1177/0734242X09339325] ]. The study also emphasised that the introduction of LFG utilisation fully into Morocco’s energy sector will be a win-win party for all and sundry [10Scheutz C, kjeldsen P, Bogner JP, et al. Microbial methane oxidation processes and technologies for mitigation of landfill gas emission. Waste Mangement & Research. 2009; 27: 409-55. [http://dx.doi.org/10.1177/0734242X09339325] ]. Reduction in greenhouse gas emission effect: LFG operation is a major source of methane gas in the atmosphere. It contributes about 17% of the total anthropogenic methane emission in the atmosphere. Therefore, when LFG utilisation project is installed CH4 is burnt and converted to carbon dioxide and water. In addition, the conversion and burning of CH4 reduces the emission of GHGs into the atmosphere. Acquire Carbon credits: in developing world CDM helps in financing projects of renewable energy so as to reduce GHG emissions of which LFG utilisation projects is one of. LFG projects are registered with the CDM thereby earning carbon credits for the reduction of the amount of methane emitted into the atmosphere. Reduction of odour in the vicinity: with the LFG utilisation projects, the collection of LFG helps in the reduction of odour. Gases like H2S which are formed during the decomposition of waste in the landfill are collected along with the LFG during the utilisation process. Reduction in potential fire outbreak: CH4 which is a highly flammable gas has the potential to cause fire outbreaks in landfill sites. The collection of the LFG helps reduce the uncontrolled emissions of the LFG thereby avoiding contacts with objects that can easily ignite a fire. Electricity generation: LFG utilisation project is known for its electricity generation capacity and has been a success over the years. Approximately, 70% of LFG projects are used for electricity generation. These LFG projects can serve as alternatives to power generation in Africa, which is one of the major problems facing the African continent. Since 1970 LFG utilisation technology has been thriving over the years, developed nations have recorded positive progress in the utilisation of LFG into various forms of energy. However, European Union seeks to reduce MSW generation, which will result in reduction in the disposal of MSW in landfills. Africa comprises of developing nations, compared to the developed nations. Most of the MSW generated in Africa is deposited in dumpsites and very few in landfills; this alone reduces potential collection of LFG. Although, some plans and executions have been put in place for construction of landfills, factors like capital, human resources and expertise have led to poor execution. The utilisation of LFG in Africa is in its preliminary stage owing to poor technical knowhow and expertise on the collection, management and operation of LFG utilisation technologies. With the rising demand for energy across Africa and rapid urbanization, energy supply has not increased at the same pace with urbanisation. There could be tremendous increase of potential energy generation in Africa if the potential LFG generated is collected and used for energy generation. Most African countries face energy problems; with proper use of LFG generated some of Africa’s energy problems will be averted and this will also result in increase in economic development. The African governments should enforce and provide good policies and guidelines on MSW management and waste disposal. More extensive research should be conducted on the different ways in which LFG can be used for energy generation in Africa. More sensitisations and workshops by the government/waste authorities on proper waste disposal and management in homes, schools, market places, industries etc., are needed. Sponsorship and scholarship programs should be introduced to environmental scholars in Africa to learn the basics and techniques of LFG utilisation technologies and operations. This will increase the knowledge on the utilisation of LFG in Africa. Although landfilling is not the best technique for MSW management; the government should encourage and build more landfill sites to reduce many illegal dumpsites in Africa. Health Protection Agency. Impact on Health of Emissions from Landfill site, Advice from the Health Protection Agency. Available online: https://www.gov.uk/government/uploads/system/uploads/attachment_data/file/334356/RCE-18_for_website_with_security.pdf (accessed on 7th November, 2016). Population A. Available online: http://worldpopulationreview.com/continents/africa-population (accessed on 9th July 2017). Mwesigye P. Africa review report on waste management. In Proceedings of the 6th session of the UNECA Committee on Food Security and Sustainable Development (CFSSD)/Regional Implementation Meeting (RIM) for CSD-18, 2012. Addis Ababa, Ethiopia. Available online: http://repository. uneca. org/handle/10855/3134 (accessed 6th December, 2017). Agency for Toxic Substances and Disease Registry (ATSDR). Landfill gas premier: an overview of environmental health professionals. Available online: http://www.atsdr.cdc.gov/hac/landfill/html/intro.html (accessed on 7 October 2016). Bialowiec A. Hazardous emissions from municipal solid waste landfills. Some aspects of environmental impact of waste dumps. Contemporary problems of management and environmental protection, 2011; 9: 7-28. Available online: http://www.uwm.edu.pl/environ /vol09/vol09_chapter01.pdf (accessed on 30th of September 2017). Strachan LJ, Pass J, Couth B. Trading landfill gas: kick starting green gas-to energy. Proc Waste Con 2006. International waste management biennial congress and exhibition. Somerset West., 5-8 September 2006. IMWSA: Institute of waste management, SA, Johannesburg. Directive E W L. 1999. Council Directive 1999/31/EC. L, 182(1), 26-4. Medarac H, Scarlat N, Monforti-Ferrario F, Bodis K, Krstic A, Dallemand JF. Analysis of Croatian potentials of municipal solid waste for bioenergy. 23rd European biomass conference and exhibition (EUBC&E) 2015 in Vienna, Austria. Hoornweg D, Lam P, Chaudhry M. 2005. Waste management in China: Issues and recommendations. Urban Development Working Papers, (9). Mourant A. Spotlight on landfill gas energy: eye on china and india Available online: http://www.renewableenergyfocus.com/ view/37403/spotlight-on-landfill-gas -energy-eye-on-china-and-india/ (accessed 4th December 2017). Achankeng E. Globalization, urbanization and municipal solid waste management in Africa. Proceedings of the African Studies Association of Australasia and the Pacific 26th Annual Conference 2003. Centre of People and Environment (CPE). Landfill recovery and use in Nigeria (pre-feasibility studies of using LFGE). Final report for EPA, Methane-to-Market program. Washington D.C.2010. Adewumi IK, Ogedengbe MO, Adepetu JA, Aina PO. Aerobic composting of municipal solid waste and poultry manure.J Applied Sc Res 2005; 1: 292-7. Available online: https://pdfs.semanticscholar.org/f627/ 5120149b7403f8108e98e1f534232cf9ac3c.pdf (accessed on the 2th may 2017). Mutezo GT. Challenges impeding South African municipalities from adopting waste-to-energy schemes: an exploratory approach, Doctoral dissertation, University of Cape Town,2016. Shakow D. Climate Change and Environmental Ethics. Routledge. Nanda, V.P Eds., Routledge: New York, USA, 2017. ISBN 178-1-4128-1459-1.